Hi everyone! It's been a while since I've written here. I hope to write a full update soon. For now I just wanted to let you know that I've released a new music video. It's for my Japanese song "Shizukanako." Please take a look! Let me know what you think. And if you like it, please share it around! Happy anniversary to me! Today marks a year since I arrived in Japan. What a year... My expectations of Japan were quite high, and it has surpassed all of them. I am glad to say that I am still excited for and eager to learn Japanese, meet Japanese people, and immerse in Japanese culture. My language skills have improved to the point where I am able to make friends with people who don't speak any English at all. Learning Japanese has allowed me to get into the music scene too, booking shows in live houses and collaborating with Japanese musicians. In addition to studying the language which I still do almost daily and making friends, my year has consisted of moving three times, having changing jobs twice, traveling to Osaka and Aichi, going to the beach in Chiba, eating all kinds of food, becoming a regular at cafes where they know my order, traveling to Korea, playing ten live shows, and most recently, recording a 2-song single CD. The title track for the CD is Shizukanako (Quiet Child), my first recording of an original song in Japanese. I recorded it along with violinist Yoshimi Sugiura, of the jazz band Atomic Heart. The other track is called "Lost in Japan," a song I wrote exactly one year ago, upon first arriving in Japan. The calligraphy on the CD cover was painted by my Nagoya friend Yuka Nozue. I'm so grateful to have such talented friends! I'll be releasing that CD at my show at Mona Records live house in Shimokitazawa, Tokyo on October 6th. You can look here for information if you'd like to come! My next project is a music video for　Shizukanako, which I'm producing with Marina Maekawa and Natsuki Toshinari. I'm excited to share it with you when it's finished. 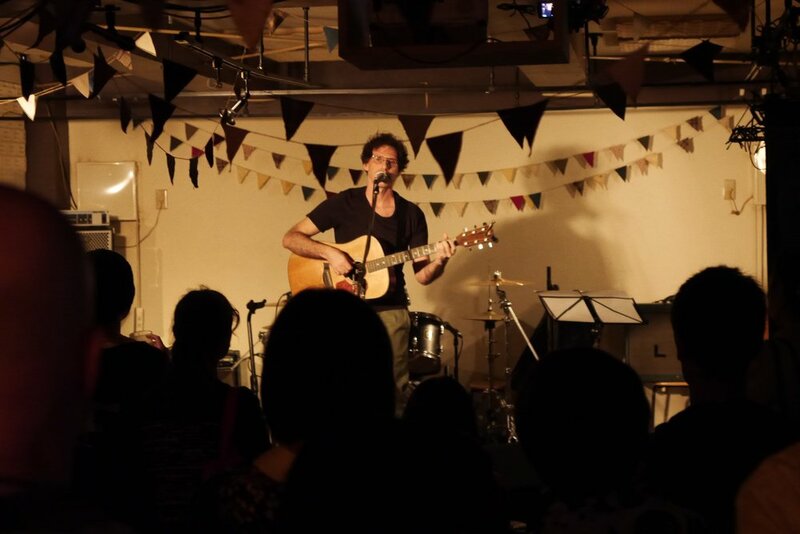 I'll also be playing some other shows in October and November, including a birthday party show on my birthday on October 28th at my friend Megumi Rain's beautiful Cafe Cheshmeh in Sasazuka. Mizukijiku and Raven's Tale -- two great local singer-songwriter duos will join me for the celebration. This has been a life-changing year, and I can't wait for the year to come! I'll be in touch! Hi everyone! It's been a few months since I've written, but I'm still here. Last month, on June 30th, I reached an important goal I had set for myself. I played a show at Mona Records in Shimokitazawa. Mona Records caters to Japanese indie rock and folk groups, and it was the first show I've played that's within the Japanese music scene. Especially to play in Shimokitazawa, my favorite town in Tokyo and where I live, was like a dream. Here's a video of the show! This was the last in a series of 5 shows in 2 months. I'm going to take a break from live shows now for the summer. I'm planning to record two songs, Lost in Japan and Shizukanako (Quiet Child) and release them as a single at my next show on October 6th, which will be my anniversary show (it will have been one year since my arrival in Japan). I might even make a music video for one of them if time allows. I'll keep you posted. Enjoy the video, and talk to you soon! Today's post is a story about my neighborhood. I wrote it to study Japanese, but it's a true story. This is the English translation. Near my home, between my apartment and the train station, there's a small butcher's shop. Of course, they sell other things besides meet. Three people work at that shop: A man, a woman, and an old man. I believe that they are a family. Three or four times a week, I go there to buy various things. Usually it's at night, after work, and the old man is working. I've been there so often that the old man has gotten to recognize my face. About three weeks ago, he asked me "What's your nationality?" "I came from the United States, but I'm originally from Argentina," I answered. The old man was surprised and asked "Do you speak Spanish?" "I do," I answered. The old man said "Buenas noches," and I replied, "Buenas noches." "Gracias," said the old man. "De nada," I said. Then I paid for my purchase and went home. The next evening, I went back to the store to do some shopping. The old man was there. "Good evening, welcome," he said, and then "What's your nationality?" "I'm Argentinian," I said. The old man was surprised and happily said "Really! Buenas noches" again. Since then, when I go to the shop, we always have the same conversation. He is my first old Japanese friend. Last week I ventured into Mona Records, a live house in Shimokitazawa that has been recommended to me as a place that's good for acoustic, indie-folk sets. I spoke to a manager regarding playing a show there. Once again, despite my endless hours of studying Japanese, I was able only to sputter loose words and to grasp even fewer and looser words from what was said. But eventually we managed to exchange the relevant information, and I've booked a show there for May! In the meantime, I'm continuing to play shows within the ex-pat scene -- at Pub Republic Irish pub in Otsuka, Restaurant Papera in Shinjuku, and most recently at Infinity Books near Asakusa. The scene has been quite supportive and everyone's been very inviting to me. It's been nice to be able to land in Japan and right away find shows to play. I'm thankful to the organizers, especially Andi Brooks, Ade Crawley, and Maya Masaki Knighton of Magic Marmalade Folk Duo, who I shared the bill with on a couple of weeks ago. I'm starting to dream up plans for recording my next album at the end of this year and releasing it (perhaps along with a Japan or Asia tour) the following summer. I'm thinking of presenting the songs as I've written them chronologically, as a sort of documentation of my journey to and within Japan. Perhaps too much of my future is unknown for that sort of planning right now, as I'm still fighting to find solid ground and to learn to communicate with the people surrounding me, but I'd love to hear your thoughts on it. In the meantime, here's my latest song, possibly titled "And You Save Me." Enjoy! It's December, and I am still in Japan. I've been here three months so far and it still exceeds my expectations. I'm slowly improving my Japanese, though I still fumble and spout out random words when I'm in a stressful situation such as a restaurant or on the street. I saw a woman riding a bicycle with her baby (a common occurrence here) and her baby dropped its stuffed plush dog. All I could say was "Excuse me" and I forgot the words for "dog," "drop," "here you go." But in calm situations, like over coffee with friends, I'm able to converse about most day-to-day topics. And I'm making steady progress on The Little Prince in Japanese. I discovered a Japanese band I liked online, called Sonotanotanpenz. I reached out to them by email (in Japanese) to see if they could send me the lyrics. And they did! I'm going to see them in Shibuya on December 27th. My own attempts to write songs in Japanese still tend to end after the first verse, as I'm not quite able to intuit sentences that mean what I want them to mean while fitting a rhythm, using correct grammar, and sounding good–let alone sounding natural. But, I tread on. Here's my latest attempt, in my PJs. I've been playing some shows in the ex-pat scene, at places like an Irish pub named Pub Republic. It's a friendly and welcoming crowd there, but I'm excited to see how my music does for a mostly Japanese audience. I plan to do my first live-house show in early spring. Probably in Shimokitazawa, where I will move to soon. I am not yet homesick. I will admit I miss some things, mostly eye contact and smiles from strangers. Japanese kindness, which is abundant, seems to be reserved for those they are interacting with. When no interaction is necessary, I sense a certain coldness and ignoring of others that leaves me wanting. Even toddlers here somehow know to behave, be quiet on the train, and avoid eye-contact with strangers. I sometimes spend my days wondering that the world is like to a Japanese toddler.